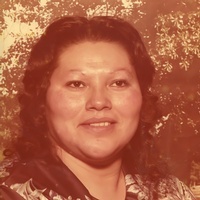 Estelena LittleCharley, 62, of Shawnee, Oklahoma passed from this life Sunday, March 24, 2019 in Oklahoma City. She was born March 1, 1957 to Scott and Marie (Polecat) LittleCharley in Norman, Oklahoma. Estelena grew up in Little Axe and graduated from Macomb High School. She lived most of her life in the Little Axe, Tecumseh and Shawnee areas. She was a hard worker and dedicated homemaker. She always said “Where There is a Will There Is A Way”. She would do anything for anyone and was a strong woman and good example for her family. She enjoyed spending time with her family and dearly loved her grandbabies. She was preceded in death by her parents; 2 brothers, Carl Spoon and Jimmy Ray Mohawk; and 3 sisters, Sarah Littlehead, Wanda Spoon and Joyce LittleCharley. Survivors include 2 daughters, Karri Condra and Melanie Sallee; 2 grandchildren, Ebaney Lynn Wietelman and Karter Williams; 4 sisters, Linda Foster, Shirley Simpson, Jackie Graham and Michelle Frye; 2 brothers, Eldon LittleCharley and Newman “Joe” LittleCharley; 4 nieces, Ashley Spoon, Montana Littlehead, Zoe Frye and Tina Spoon; 6 nephews, Austin Johnson, Eric Spoon, Nicholas Johnson, Michael Johnson, William “Bubba” Scott and Carl “Maudy” Spoon; and other extended family and friends. Tribal Rites will be 6:00 p.m., Tuesday, March 26, 2019 at Brendle Corner with George Blanchard officiating. Burial will follow on Wednesday morning at LittleCharley Family Cemetery in Rainbow Valley under the direction of Cooper Funeral Home of Tecumseh.